LePage impeachment failed, so what’s next for Maine? People hold signs at a rally in support of Gov. 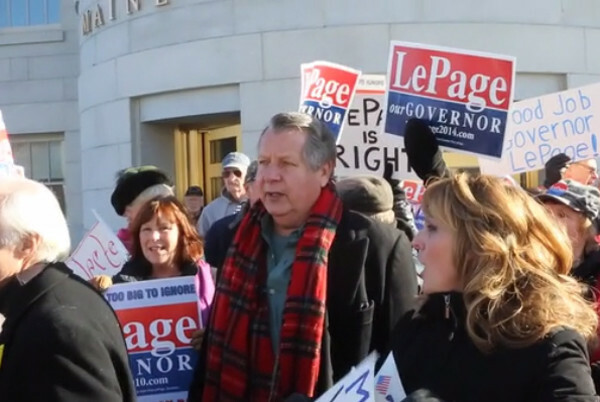 Paul LePage on Wednesday outside the State House in Augusta. AUGUSTA, Maine — The months-long buildup to the House’s impeachment debate Thursday ended with the effort’s failure and passage of a Democrat-sponsored resolution seen by many as having no teeth or sustained meaning. The lawmakers behind the impeachment effort heralded Thursday’s marathon debate as worthy because it put Republican Gov. Paul LePage on notice of the extent to which his opponents will go if he continues a pattern of, from their perspective, abusing powers as the state’s chief executive. “If he continues to bully people and pressure people out of jobs and misuse state assets, we won’t hesitate to bring another order forward if it’s necessary,” Democratic Rep. Ben Chipman said Thursday afternoon. The fact that 52 Democrats showed support for the order arguably can be seen as a victory for Chipman and the progressive wing of the party because early estimates were that impeachment was doomed from the start and that only far-left liberals would support it. However, the House members who introduced the impeachment order were an independent and Democrats generally considered to be on the fringes of the party. Leadership Democrats did not co-sponsor or advocate for the impeachment order. Technically, the order to launch Chipman’s impeachment investigation never went to a vote. Thursday’s vote was on a motion to indefinitely postpone the order. While that motion was made by Republican House Minority Leader Ken Fredette of Newport, it may have inadvertently given election-year cover to Democrats looking to avoid questions about impeachment during the campaign. They can say they technically never voted for or against impeachment. Among the Democrats who voted against postponement were Majority Leader Jeff McCabe of Skowhegan, who is running for Senate this year, and Assistant Majority Leader Sara Gideon, who is in line for a more significant leadership position if Democrats hold the House majority in 2016. Gideon was the primary sponsor of the civility resolution portrayed by some as a rebuke of LePage, though it does not mention him. McCabe and Gideon voted for the civility resolution. Chairs of such key committees as Judiciary and Appropriations voted for indefinite postponement, which could signal a divide between Democrats who want LePage ousted from office and those who for various reasons were not willing to support impeachment. If any pattern could be discerned from the split among House Democrats, it was that more experienced, influential members wanted no part of impeachment. Among Democrats who voted to block impeachment were Mark Dion of Portland, Peggy Rotundo of Lewiston, Louis Luchini of Ellsworth, Lori Fowle of Vassalboro and John Martin of Eagle Lake, who clearly tried to use his decades of tenure in the Legislature to sway votes toward indefinite postponement. Why does it matter how Democrats voted? It’s an election year, and everything that happens at the State House could end up as campaign fodder. In a Critical Insights poll conducted in October 2015, 52 percent of Democrats said they think Maine is on the wrong track and 42 percent of all respondents blamed LePage and his policies. While 63 percent of Republicans had a positive view of LePage, a whopping 79 percent of Democrats did not. Here’s the bottom line: LePage’s approval rating in October 2015, at 32 percent, was as low as it’s been since spring 2011 after peaking at 45 percent in 2014. In 2012, the most recent presidential election year, Democrats running for the Legislature hammered LePage, a strategy that won back House and Senate majorities lost to the GOP in 2010. Impeachment has never happened in Maine and Thursday’s proceedings were as close as the state has come to ousting a governor, which for some Democrats is unquestionably a priority. Will Democrats who balked at impeachment suffer in this year’s elections? They’ll surely have some explaining to do at the state convention and on the campaign trail. And, the discussion about ousting elected officials might not be over. Democratic Rep. Justin Chenette of Saco is proposing a bill to establish a recall process in Maine, which would allow voters to pull a governor or lawmaker out from under the dome. The bill requires approval of the bipartisan Legislative Council before it can be introduced, which could be a tough climb given that the second year of each legislative session normally is reserved for budget tweaks and emergencies. LePage’s actions as governor have divided the electorate, causing many Democrats to fixate on finding ways to oust or neuter him. Republicans who support LePage characterized the impeachment effort as a desperate attempt by Democrats to use their majority in the House to achieve what they could not accomplish at the ballot box. LePage for weeks labeled the impeachment proceedings “a witch hunt,” claiming there is no legal basis to impeach him. Although plenty of lawmakers and LePage opponents disagree, from the perspective of the electorate LePage’s argument probably had legs. It was bolstered in December when Democratic Attorney General Janet Mills and Kennebec County District Attorney Maeghan Maloney announced they would not pursue criminal charges against the governor. Expect LePage to use the impeachment debate as Exhibit A as he takes his case to voters that legislators waste time and fail to focus on Maine’s pressing needs. That narrative, however, will continue to make it difficult for LePage to win legislative approval of his policy goals, opening him to further claims of ineffective leadership. LePage painted himself into a political corner during last year’s bruising legislative session when he went on a historic veto spree with the stated intention of wasting the Legislature’s time. He repeatedly lashed out at members of his own party and even pledged to campaign against some of them this year, thereby undermining relationships with potential Republican allies in the Senate. In recent months LePage has taken many steps to circumvent the Legislature altogether, most recently when he tried to derail a legislative bill to fight drug addiction with a financial order. Legislative leaders repeatedly have said they want to work with LePage on this year’s important issues — such as the drug bill and efforts to fund indigent legal services and county jails — but LePage has shown innumerable times during the past five years that he is a “my way or the highway” leader. That’s unlikely to change with rancor over impeachment washing through the State House. Split majorities in the Legislature and a Legislature that’s largely at odds with LePage — not to mention the fact it’s an election year — probably means little will be accomplished this year. With the exception of a few issues that need attention, the state’s finances are in the black and there are so far no major crises that demand immediate action. That said, expect Democrats and Republicans to make a lot of noise with election-year proposals that have no chance of passage, such as expanding Medicaid to tens of thousands more Mainers, all with an eye toward November and the crushing amount of campaign rhetoric that will blanket Maine between now and then. Although his name won’t appear on any ballot, expect LePage to be the focus of much of that rhetoric. Correction: A previous version of this report misspelled Rep. Lori Fowle’s name.